The history of the illumination and lenses of DeTour Reef Light begins with a meticulously crafted 1908 French Fresnel lens to the current beacon that looks like something from Star Wars. When DeTour Reef Light Station was constructed in 1930-31, the 1861 lighthouse tower from DeTour Point with its 1908 3Ω-order Fresnel lens was relocated to the reef light station. This lens was configured as a flashing white light with a characteristic of a one-second flash and a nine-second eclipse. The lens was manufactured by Barbier, Benard & Turenne Co. of Paris, France at a cost of $2,940.50 ($73,512 in 2012 dollars). The original shipping weight of the lens and components was 4,480 lbs. In 1936, the color changed from straight white to white with a red sector to the North West to warn of the dangerous reef. This was accomplished using a color plastic inside the lantern (the glass-enclosed room containing the beacon) which is unchanged to this date. 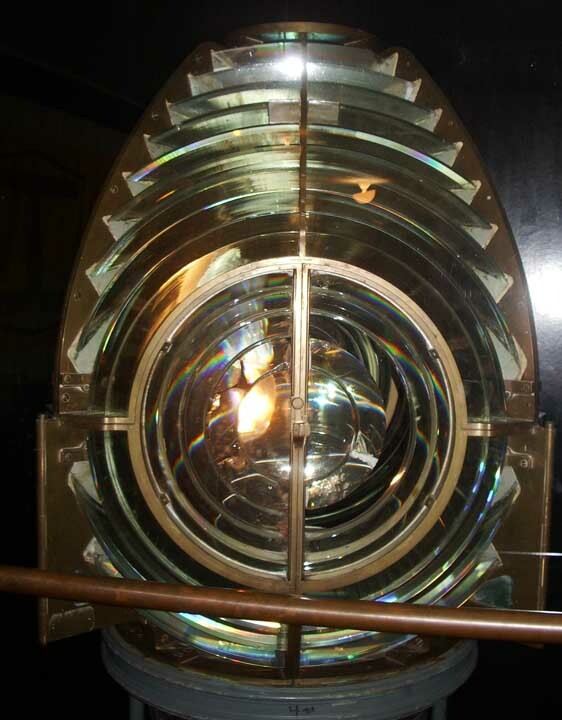 In 1978, the Fresnel lens was removed and replaced by a modern beacon. The 1908 lens and its timing mechanism are now on display at the DeTour Passage Historical Museum. From 1996 until May 15, 2012, a Vega VRB-25 served as the beacon for DeTour Reef Light. On May 15, the U.S. Coast Guard installed an eight tier Vega VLB-44 LED Marine Beacon in the lantern of DeTour Reef Light, replacing the Vega rotating beacon (VRB-25) that has been in DeTour Reef Light for about 15 years. Vega Industries is a New Zealand company. The DeTour Reef beacon is programed to flash white every 10 seconds (with a red sector to the North West). As such, it does not rotate. The vertical divergence is 2.5 degrees ñ making the beacon only visible at water level and not visible to aircraft at flying altitudes. The total power consumption is a maximum of 80 watts per each flash resulting in average power consumption per day of 96-watt hours. Seventy-four feet above the water, the beacon has a range of 16 miles. The prior VRB-25 beacon by Vega was six sided (six lenses) and rotated continuously day and night, although the 22.5-watt incandescent lamp was activated at night by a photocell. Six bulbs in an automatic changer (like a ferrous wheel) assured continuous service when a bulb burned out. The beacon had to rotate during the day because sun light is focused through the lens, and if the lens were stationary, the intense heat would destroy the beacon. Power consumption to rotate the beacon was about 2 watts. Accordingly, the average power consumption per day would be about 318 watt-hours. As installed in DeTour Reef Light, the VRB-25 range was 18 miles. When the VRB-25 was removed from the lantern, the Coast Guard donated it to the DeTour Reef Light Preservation Society which has it on display in the lighthouse basement. All of the aids to navigation on the lighthouse are powered by a 12-volt battery bank, which is charged by solar panels. Concurrent with the introduction of the LED beacon, the Coast Guard reduced the number of solar panels from ten to four. This corresponds to the 60 percent reduction in power usage by the beacon. Other aids to navigation powered from the battery bank are the foghorn (which is activated by a signal from marine radios) and the radar beacon (RACON) which transmits the Morse code letter ìDî (dash dot dot) to radar receivers. The Morse code dash-dot-dot identifies the lighthouse so the boats using radar do not mistake the lighthouse for a large ship.